The Triumph Factory Visitor Experience is a brand new world class exhibition showcasing the design excellence, engineering precision and human endeavour that goes in to the manufacture of Triumph motorcycles. 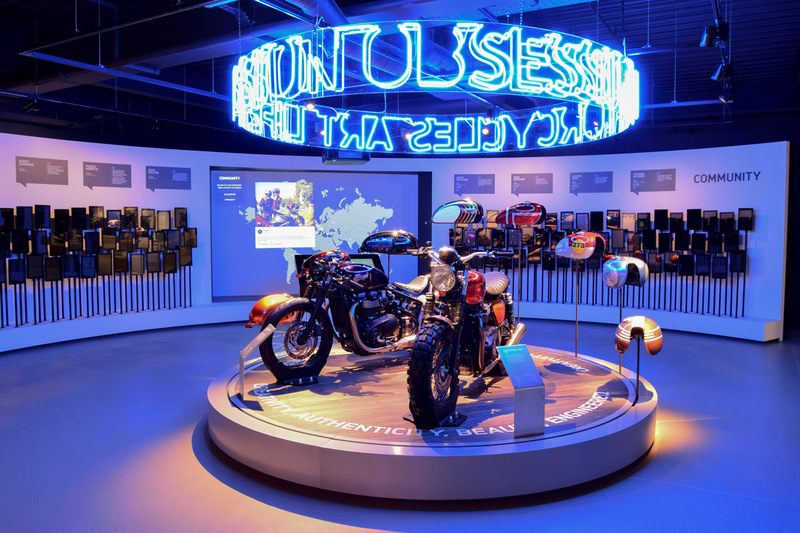 Located at Triumph's Hinckley factory HQ, this immersive experience allows visitors to connect with some of the most iconic Triumph motorbikes at the home of Triumph manufacturing. Visitors embark on an engaging journey throughout eight thematic zones divided across two floors. These themes are defined as Attitude, BloodLine, Performance, Iconic, For the Ride, Individuality, Belonging, and Design. Sysco worked closely with Studio MB throughout the design development and integration phases to integrate AV technology within the experience, complementing the ingrained quality, innovation and prestige of the brand.